During the Cultural Revolution in China, Ye Wenjie, an astrophysics alumna from Tsinghua University, witnesses her father being beaten to death by Red Guards from Tsinghua High School, the latter being supported by Ye's mother and younger sister. Ye is officially branded a traitor and is forced to join a labor brigade in Inner Mongolia, where she befriends a government journalist who recently read Silent Spring, and who wishes to write a letter to the central government containing policy suggestions based on the book. When the central government responds, viewing the letter as an act of sedition, the journalist betrays Ye, who helped to transcribe the draft, and Ye is set to enter prison. However, she is salvaged at the last minute by Yang and Lei, two military physicists working under Red Shore (a Chinese initiative for alien communication similar to SETI) who require Ye's skills in physics. Ye discovers the possibility of amplifying outgoing radio messages by bouncing them off the sun, and fires off a message. Eight years later, by now in a loveless marriage with Yang, Ye receives a message from a concerned alien pacifist, warning her not to respond or else the inhabitants of Trisolaris will locate and invade Earth. The alien proceeds to describe Trisolaris's environmental conditions and societal history. Ye, who has come to despise humankind, responds anyway, inviting them to enter Earth to settle Earth's problems. Ye murders her husband, Yang, and Lei to keep the alien message a secret. And off we go, through many, many plot complications and two further books (The Dark Forest and Death's End), both of which are now available in English. Cixin Liu's work has been very well received in the English speaking world, with The Three Body Problem winning the two most prestigious science fiction awards, the Hugo and Nebula awards for best novel. All the cool kids are reading this guy (including Barack Obama!). Can you afford to be left behind? Die Toten Hosen are a German punk band from Dusseldorf. They really nail it on this punk version of Auld Lang Syne, which I urge you to play LOUD. And the video gives you some idea of what the annual neighborhood New Year's Eve party at my place is like. A formula you say? There's a formula for a blue Texas? Well, sort of. I mean this in the sense that a sober quantitative accounting of the challenge Democrats face in Texas provides a useful guide to how the blue Texas goal can actually be attained. More useful I think than the countless breathless accounts of grassroots Democratic organizing in Texas (here's a recent example), which make little effort to explain which groups have to move and by how much to be successful. So here's the "formula". In 2016, Clinton improved over Obama in Texas, reducing his 16 point deficit in the state to 9 points in 2012. How did she do this? The dataset developed at CAP for our Voter Trends in 2016 report indicates that Clinton improved over Obama among both white non-college-educated and college-educated voters. The Democrats’ deficit among Texas’s white non-college-educated voters fell from 60 points in 2012 to 55 points in 2016. The shift toward Clinton among white college graduates in the state was even larger—from a 30-68 percent deficit in 2012 to 37-57 percent in 2016, a margin improvement of 18 points. The white college-educated improvement cut Clinton’s deficit in the state by about 4.5 points and the white noncollege improvement moved things in her direction by about 1.5 points, for a total shift of 6 points toward Clinton from better performance among whites. The rest of Clinton's gains relative to Obama were accounted for by improvements in Latino turnout and support. This suggests that the correct formula for a blue Texas is not to rely on demographic change and better mobilization of existing pro-Democratic constituencies, which often appears to be the default strategy. That is not likely to be enough to cut the additional 9 points off of Democrats's statewide deficit anytime soon. Instead, while demographic change will continue to provide a boost to Democratic prospects and mobilization efforts should continue, the key question is how to keep the trends evident in 2016 going. Rough calculations indicate that if Democrats can cut their white noncollege deficit to 45 points and their white college deficit to 10 points, while continuing positive, if unspectacular, Latino trends (getting Latino turnout of eligibles to around 40 percent, while improving Latino vote margin to around +30D), that should be enough to flip the state or come very close. Note: I'm not saying this would be easy to do! But I do believe the formula would work and builds plausibly on current trends. The book's plot involves a planet inhabited by evolved spiders uplifted by human scientists, and their later discovery by the last humans alive in the universe. The work plays off the contrast between the societal development of the spiders and the barbaric descent of the starship crew of the last humans. The work was praised by the Financial Times for "tackling big themes—gods, messiahs, artificial intelligence, alienness—with brio." It was selected from a shortlist of six works and a total pool of 113 books to be awarded the Arthur C. Clarke Award for best science fiction of the year in August 2016. The director of the award program said that the novel has a "universal scale and sense of wonder reminiscent of Clarke himself." All true. This is a fantastic book and the portrait of the uplifted spider society is amazing; so vivid you could see it existing in real life (somewhere). And it's now available in a Kindle edition for $0.99; if that isn't a bargain I don't know what is! Grab it immediately if not sooner. It's a funny kind of anti-immigrant fervor that's gripping the country. It's just not that fervid. Even as we suffer from President Trump and his lunatic co-conspirators in Congress, the country as a whole is moving rapidly away anti-immigrant views. This point is well-made in a recent column by Noah Smith where he notes the contrast between today's trends and previous waves of anti-immigrant sentiment in the early 20th century. We're moving in the exactly wrong direction to have such a wave. This is, as Joe Biden might put it, a big f____ deal. The chart above is from NBC poll data and ends in April. There's been one other NBC poll with this question since then.....and it's even more pro-immigrant (64 percent, immigration strengthens the US; 28 percent, immigration weakens the US). These trends are similar to those found in a recent Pew poll. Almost two in three Americans think immigrants "strengthen the US with their hard work and talents" (highest ever! more than double the number back in 1994!) compared to little more than one in four who think immigrants "burden the country by taking jobs, housing and health care". And sure there is indeed a big divide between the parties on this issue but in recent years that's because both Republican and Democratic partisans have become liberal in their views, but Democrats are getting more liberal faster (this is the same pattern found in the NBC polls). The chances that the 2020's are going to look like the 1920's look pretty remote to me. Indeed, I would venture to predict that decade will be one of exceptional progressive advance. More on this some other time. Democratic Wave Watch: How High the Crest? And while the CNN poll is a bit of an outlier, the Democratic advantage in the FiveThirtyEight generic ballot aggregate is up to about 12 points, 49.6 percent to 37.4 percent. That average, like the CNN poll, also shows Republicans in worse shape right now than any other majority party at this point in the midterm cycle since at least the 1938 election. The generic ballot is surprisingly stable and will probably not change that much between now and election day. The generic ballot is a pretty good predictor of the popular vote for the House. It's not realistic for the GOP to lose the popular vote by as much as they now appear likely to and retain their control of the House. Item: Republican losses are likely to extend all the way down the ballot. The Democrats have gotten pummeled in state legislative elections for several cycles and that has had dire consequences for the party's strength, not least in terms of control over redistricting. That's probably about to change. After years of strong gains in states across the country, Republicans now fear they stand to lose hundreds of state legislative seats in next year’s midterm elections if there is a significant voter backlash against President Trump. Any losses would come at the worst time: Just ahead of the redistricting process that begins with the 2020 census…..
Republicans took note of last month’s [state legislative] elections in Virginia, where Democrats performed far better than either side expected, spurred by a wave of suburban support. Item: No, the tax bill will not save the GOP. The just-signed tax bill, which is historically unpopular, is highly unlikely to reverse the current dreadful political climate for the GOP. John Judis does about a good job as one can of arguing that--if the GOP is lucky and plays things right--it might not worsen their situation much and perhaps even be a small plus. But he still doesn't see the bill as rescuing them from their current situation. [A key] factor behind the lack of public support for the tax overhaul [is] the public’s perception that some people are more likely to cash in than others. Though the bill will offer most taxpayers some relief in the near term, analysts believe that the benefits to corporations and relatively wealthy taxpayers will be much greater—especially over the long haul. Importantly, the public seems to see this: Recent polling suggests that most people see the bill as a boon to the wealthy above all. Psychologists also find that relative deprivation can be especially powerful when it appears to violate some standard of fairness. So, if a citizen thinks that tax reform will benefit the wealthy more than the average person and that the wealthy already fail to pay their fair share, her anger might be stronger. Hmm. Sound like any tax bill you know? Best Christmas song ever! If you're tired of the same old same old, feast your ears on the Cotton Top Mountain Sanctified Singers and their totally funky, raw version of "Christ Was Born on Christmas Morn". Bonus: the group was fronted by Frankie "Half-Pint" Jaxon, a noted female impersonator and purveyor of bawdy songs (he wrote "Fan It" among other classic numbers). If more Christmas songs had this much soul, I wouldn't get so damn sick of Christmas music! Can the EU Muddle Through? At this point, it's utopian to believe that the EU will be able to continue as-is for another decade. A priori it also seems unlikely that the EU will reform or that the EU will collapse, but these are the three utopias/dystopias that are typically mentioned. And I think "continue as-is" is the least likely of all. Such a development is not sustainable, neither for Germany nor for the South. In Germany, the negative interest rates are destroying the pension funds and, more importantly, the Sparkasse model - and 50 million out of 83 million Germans have their bank accounts at Sparkasse. Even if the big fish tend to use other banks (which are struggling as well but are freer to compensate by speculating on the stock market), the German state will not be able to make good on its promise to insure the deposits of 50 million Germans. In the South, seasonally adjusted youth unemployment ranges between 25% (Portugal) and 43% (Greece). Even France has 23% youth unemployment. And this has been pretty much since 2010. The promise of improvement "just around the corner" won't be believable much longer - many already don't believe it and have punished each establishment party that promised it in turn, or that was tone-deaf to the reality that people are living. You may well get a crisis. And consider that the IMF planned to orchestrate a close brush with a Greek credit event in summer 2016 (as they did in 2015) in order to force the EU to find a solution. They couldn't do it then because their plans were leaked, but if they were ready to do it then, who says they won't do it on another occasion. Now when we talk EU reform, many groups and indeed heads of government have plans that won't work because they'll require treaty change, i.e. the approval of 28 national parliaments through a process that may well take several years. That is why DiEM25 has come up with innovative ways to stabilise the situation that could be implemented tomorrow morning if a few key people agreed, without the need to change any treaties. For example the introduction of an EU-wide food stamp program funded from TARGET2 surpluses. It's not necessary to turn the EU into a federation in order to have this kind of very basic federal program, which would let off the populists' steam in the hardest-hit countries (the ones that incidentally cannot currently fund an own foodstamp program). Or having the ECB relay its ultralow interest rates for national debts amounting to up to 60% of GDP, while debts above that amount would continue to run at the rates each country can procure. It would immediately reduce Europe's debt burden by 1/3, while not creating moral hazard for countries to get any more indebted than necessary. In fact the incentive to stay within the Maastricht boundaries would be much higher by having a great differential between Maastricht-compliant and non-compliant debt, whereas right now the worst that can happen is having a fine slapped on you. DiEM25 also foresees hypercharging the European Investment Fund and European Investment Bank, which have a mandate to prioritise helping structurally weak regions throughout Europe, and to prioritise forward-looking investments e.g. in clean energy, infrastructure and digitalisation. Poland currently generates 75% of its electricity from locally-mined coal. Those jobs are not going to be there in the long run, so if EIF investments and expertise helped them gradually build up a clean energy industry there, we could prevent an unemployment crisis at the same time as improving Europe's ecological footprint. All these kinds of things could be executive decisions with no need to push legislation through 28 national parliaments. Of course DiEM25 also has more ambitious plans - a European constitutional assembly is one of them, in order to create a less cartel-like and more democratic European governance model in the long run - but the sequencing is clear: first we need to stabilise the situation, afterwards there may be popular support for rebuilding the EU. And the most beautiful thing is that this is the best course of action independent of whether we believe that the EU will continue to exist. We hope that it will, and that we will have a chance to let Europeans write a constitution for it, but even if it breaks apart, it will be better to do so in a climate of less poverty, less xenophobia and more international bonds between citizens. The Demolished Man tells a story which in synopsis is straightforward: industrialist Ben Reich commits murder (in a society where murder is almost unknown because Telepathy-using Espers can either detect the idea before the act is carried out or subsequently read the perpetrator's guilt), almost gets away with it, is ultimately caught by Esper detective Linc Powell, and is committed to curative brainwashing, "demolition". It is the pace, the staccato style, the passion and the pyrotechnics that make the novel extraordinary. The future society is evoked in marvellously hard-edged details; the hero is a driven, resourceful man whose obsessions are explained in Freudian terms that might seem too glib if they were given straight, but are evoked with the same New Yorker's painful, ironic scepticism that informs the whole novel. I wrote a few stories for Astounding, and out of that came my one demented meeting with the great John W. Campbell, Jr. I needn’t preface this account with the reminder that I worshipped Campbell from afar… I sent off another story to Campbell, one which no show would let me tackle. The title was “Oddy and Id” and the concept was Freudian… Campbell telephoned me a week later to say that he liked the story but wanted to discuss a few changes with me. Would I come to his office?…. Around me there were cries of “BLT down, hold the mayo. Eighty-six on the English. Combo rye, relish. Coffee shake, pick up.” And here was this grim tackle standing over me, practicing dianetics without a license. The scene was so lunatic that I began to tremble with suppressed laughter. I prayed. “Help me out of this, please. Don’t let me laugh in his face. Show me a way out.” God showed me. Quite a guy. Check his stuff out.. You won't be sorry. The Republicans have managed to turn a political win—lowering middle class taxes—into an unpopular monstrosity. Their proclivity to believe that the worthiest people are business people who provide jobs for the masses has led them to give the most generous breaks to corporations, small businesses (pass-through entities), and those with high income. Of course, the fact that these people are their major donors is one that they try to hide. The unpopularity of this bill doesn’t negate that the Republicans have won the argument over Reagan’s statement that ‘the government is the problem and not the solution.’ Faith in the federal government has been low for a long time, which makes tax cuts always popular. People don’t understand where the federal government spends its money, although they feel like that their benefits are deserved. Consequently, even if they, their parents or their children receive public benefits, they think that the government wastes lots of money and can easily do with less. Another major reason to cut taxes is to “starve the beast". Since defense spending can’t be cut, reductions in revenues lead to bigger federal deficit which leads to calls to cut the deficit by reducing spending on social programs. Because the Republicans worry about losing the House of Representatives in 2018, they are pivoting to “entitlement reform” now rather than waiting for the deficit to rise. This is a bold move now, especially since they couldn't pass the repeal and replace of Obamacare. The Republicans main attack line for decades against the Democrats is that ‘they want to raise your taxes’. Obama avoided this critique by saying that he would never raise taxes on households with incomes below $250,000. To avoid the claim that she would raise taxes, in 2016, Hillary Clinton also made this pledge and ran on a series of small tweaks and showed how they would be paid for without across the board tax increases. This has put the Democrats on the defensive and allowed Republicans to do a variety of stupid things. At a time when our roads, bridges, water lines, and air ports are in need of massive infusions of money, the Republicans have kept to their “no taxes” pledge. Remarkably, they repeatedly have blocked increasing the gas tax even during years when they economy was strong and when gas prices were low. Even though this money would be dedicated to infrastructure spending that would make our economy more efficient, keeping their no-tax pledge is more important. In the years ahead, more and more baby boomers will be retiring, which will drive up the costs of Medicare and Social Security. Although this is well known and has been somewhat planned for, the demands for higher federal spending are many: higher interest payments (and even higher when interest rates rise), much higher spending on seniors out of general revenue as the Social Security and Medicare Trust Funds are depleted, and addressing our pressing infrastructure needs. The bottom line is that we are soon going to need lots more revenue, and every progressive should support tax increases. A good plan would cut defense spending, increase the top marginal rate a bit (maybe 45 percent), have the upper middle class pay more, and even have a minor increase on the middle class. In theory, this ‘sharing of burden’ approach might be sellable. This is not a call for a balanced budget but an arithmetic issue: while we can sustain a federal budget deficit of 2 percent of GDP, we are facing deficits much higher than this if we don’t increase revenues. Cutting taxes now is an abomination driven by the Republican desire to shrink government. Like a supernova, Roger "Syd" Barrett burned briefly and brightly, leaving an indelible mark upon psychedelic and progressive rock as the founder and original singer, songwriter, and lead guitarist of Pink Floyd. Barrett was responsible for most of their brilliant first album, 1967's The Piper at the Gates of Dawn, but left and/or was fired from the band in early 1968 after his erratic behavior had made him too difficult to deal with (he appears on a couple tracks on their second album, A Saucerful of Secrets). Such was his stature within the original lineup that few observers thought the band could survive his departure; in fact, the original group's management decided to keep Syd on and leave the rest of the band to their own devices. Pink Floyd never recaptured the playful humor and mad energy of their work with Barrett. I remember vividly that when I scored a copy of The Piper at the Gates of Dawn and played it, it pretty much blew my mind. From the first cut, the haunting "See Emily Play" (the video linked to here), the whole album was, for want of a better word "trippy" and hinted at a strange, enticing world beyond my limited Silver Spring, MD horizons. Unlike Barrett, I made it back from that strange world. But I still love the album and, as Unterberger puts it, the "mad energy" behind it. Sure the Democrats Are Riding a Wave, But Won't Gerrymandering Prevent Them from Taking Back the House? In a word, no. That is to say, if there is a decent sized wave the Democrats have an excellent chance of taking back the House, despite the fact they are disadvantaged by gerrymandering. And by a decent-sized wave, I don't mean the Democrats carrying the House popular vote by a gaudy margin of 8-10 points or more. They can probably do it with considerably less. Alan Abramowitz shows this in an elegant little analysis just published on Larry Sabato's Crystal Ball. Abramowitz controls for the effect of post-2010 gerrymandering--which he does find is significant and large--and still finds that the Democrats could get a House majority with around 52 percent of the two party House vote (prior to 2010, the model indicates that slightly less than a majority of the popular vote--49 percent--would have sufficed). In recent weeks, Democrats have been averaging a lead of between eight and 10 points according to RealClearPolitics....that large a lead on the generic ballot would predict a popular vote margin of around five points and a gain of between 30 and 33 seats in the House — enough to give Democrats a modest but clear majority. There you have it. Gerrymandering is bad....but it is far from an insuperable obstacle. Jones beat Moore with a strong turnout and a crushing lead among African Americans, a decisive advantage among younger voters, and major gains among college-educated and suburban whites, especially women. That allowed Jones to overcome big margins for Moore among the key elements of Trump’s coalition: older, blue-collar, evangelical, and nonurban white voters. This was the same equation that powered the Democratic victories in the Virginia and New Jersey governors’ races. The consistency of these results suggests that Democrats are coalescing a powerful coalition of the very voters that polls have shown are the most disenchanted, even disgusted, by Trump’s performance and behavior as president…. The cycle that looks most like this one is 2006, when Democrats gained 30 seats and control of the House from the Republicans3 thanks to a hefty win in the popular vote across all House races. In 2018, they need 24 seats to win back control of the lower chamber. The difference between the average swing in special federal elections and the margin of the national vote for the House has averaged just 3 percentage points since 1994. It has never differed by more than 7 points. So even if Democrats do 7 points worse in the national House vote than the average swing so far suggests, they’d still win the national House vote by 9 points, which would likely mean that theyreclaim a House majority next year. Indeed, the special election results so far this year are merely another indication of the GOP’s precarious position. President Trump’s approval rating is below 40 percent and Democrats hold an 11-percentage-point lead on the generic congressional ballot. We’re still nearly a year from the 2018 midterms. That’s enough time for things to shift. Maybe Trump will grow more popular, for example. But historically, the environment doesn’t change much between this point in an election cycle and the midterms. So if you’re a Democrat, Tuesday’s Alabama result is just the latest special election sign that things are looking up heading into 2018. Over the last eight years, political analysts had come to think that Democrats were at a distinct disadvantage in midterm elections, since their younger and nonwhite coalition was less likely to turn out than older and white voters. It is time to retire that notion. Tuesday in Alabama, Democrats benefited from strong turnout that plainly exceeded midterm levels, while white working-class Republicans voted in weaker numbers. It was enough to send Doug Jones to the Senate instead of Roy Moore, in one of the reddest states in the country. This has been a pattern in all of this year’s major special elections, as well as in the Virginia general election. It is consistent with a long-term trend toward stronger turnout by the party out of power in off-year elections. It also suggests that President Trump’s less educated and affluent version of the Republican coalition has eroded the party’s traditional turnout advantage. It's increasingly looking like the real question is not whether there will be a Democratic wave, but how big that Democratic wave will be. That's a happy thought, perhaps enough to put a spring in your step in what has been a dark time. The Washington Post/Schar School poll, a poll that gives Jones a 3 point lead among likely voters, shows how [a Jones victory] will happen, if it does happen. First, overwhelming support from blacks, combined with solid turnout (this poll has blacks at about a quarter of likely voters, which is good but not unreasonably high). Then mega-swings in the white vote relative to 2016. Trump carried the white vote by 70 points in Alabama in 2016. In this poll, Moore carries the white vote by a mere 30 points (63-33). This scenario more or less came to pass, according to the exit polls. Black voters made up 28 percent of the electorate--beating their share in the Post poll-- and supported Jones by 96-4. And Jones lost white voters by 36 points (31-67), pretty close to the deficit in the Post poll (especially when one keeps in mind that exit polls have a chronic tendency to overestimate Democratic deficits among whites). This 36 point deficit is about half the 70 point deficit Clinton ran up among white voters in the state in 2016. Breaking down white voters between college and noncollege, noncollege whites supported Moore by 54 points--strong, but not as strong as the 77 point margin they gave Trump in 2016. White college graduates supported Moore by a mere 16 points (57-41), a mega-swing away from the GOP compared to the 55 point margin these voters gave Trump in 2016. While I don't have information on the gender breakdown of these voters in 2016, it's worth noting that Jones had a mere 5 point deficit among white college women, according to this year's exit poll. This suggests an unusually large swing by these voters toward Jones. A harbinger of what we'll see in 2018? Does this mean Jones is probably going to win? Nah. The RCP polling average still has Moore up by 2.5 points, so I guess I'd still make him the favorite. But you've gotta classify this latest poll--and the Fox News poll is typically a high-quality poll and therefore better than the a lot of the lower shelf pollsters who've worked this race--as good news. It ain't over 'til it's over. The internals of the Fox poll look very good for Jones, hitting support benchmarks that should produce a victory for Jones if they happen in the real world: a 20 point deficit among whites, a near tie among white college graduates and a mere 33 point deficit among white noncollege voters (trust me, that's good). But which voters will really show up? : not just the relative numbers of white and black voters but which type of voters within a given demographic; perhaps the likely white voters in the Fox News poll aren't actually a good representation of the white voters who who will show up on Tuesday. Just how much things can move around depending on how you capture and weight that likely voter sample is shown very clearly here by SurveyMonkey's Mark Blumenthal. So hold on to your popcorn! It could be a wild ride. Can We Please Stop Saying Trump's Base Is Immovable? I must say I'm getting a bit annoyed with the repeated claim that Trump's base of support is absolutely solid--can't be moved. This contention gets people depressed, but it shouldn't for the simple reason it's not true. Sure, Trump's approval rating is still pretty high among Republicans and people who voted for him in 2016, but for chrissake what do people expect? This is a polarized country; he's not going to suddenly have a 30 percent approval rating among partisans of his own party. But he is losing ground. He is losing support among the very kind of voters you would describe as his base and that's very important. He (and the GOP) need every vote they can get and when solid supporters start drifting off that's very bad for them. Data from a recent Pew release show this drift very clearly. Since February, he's lost 8 points in approval among Republican identifiers/leaners (from 84 to 76 percent), 17 points among white evangelical Protestants (from 78 to 61 percent) and 10 points among white noncollege voters (from 56 to 46 percent). So can people please stop spreading this myth of Trump's invulnerability? He's a weak president and getting weaker, including among his own supporters. Although van Vogt catered for the pulps, he intensified the emotional impact and complexity of the stories they would bear: his nearly invincible alien Monsters, the long timespans of his tales, the Time Paradoxes that fill them, the quasi-messianic Supermen who come into their own as the stories progress, the Galactic Empires they tend to rule and the states of lonely transcendental omnipotence they tend to achieve – all are presented in a prose that uses crude, dark colours but whose striking Sense of Wonder is conveyed with a dreamlike conviction. The abrupt complications of plot for which he became so well known, and which have been so scathingly mocked for their illogic and preposterousness – within narratives that claimed to be presenting higher forms of logic to the reader – are best analysed, and their effects best understood, when their sudden shifts of perspective and rationale and scale are seen as analogous to the movements of a dream. I love this band! Washington's own Ex Hex, fronted by Mary Timony, formerly of Helium and Wild Flag. This all-woman power trio totally rocks. Have a listen (bonus: flying saucers in the video!) and if you like what you hear, and you're in the DC area, Ex Hex will be playing December 30th at my favorite venue, the Black Cat. The Optimistic Leftist will be in the house! I saw a show of theirs previously at the Black Cat and it was one of the best shows I've ever been to. The exit polls were quite misleading on what really happened in Virginia in 2017. That was my argument, based on estimates we have done at CAP for our Voter Trends in 2016 project, which indicated that 2016 exit polls in VA had practically reversed the correct proportions of white college and noncollege voters, dramatically underestimating the share of white noncollege voters in that state (and pretty much every other state). My extrapolation, based on these data, was that the 2017 exits once again got it wrong in Virginia. Confirmation of my assessment comes from big data gurus Catalist in a ground-breaking analysis of election and polling data from Virginia by their Chief Scientist, Yair Ghitza. Combining pre-election turnout scores, precinct-level 2017 election returns and polling data, Ghitza's analysis shows that the exit polls were indeed incorrect in the portrait they painted of 2017 Virginia voters. Here's the basic story. The 2017 Virginia exits claimed that white college educated voters vastly outnumbered white noncollege voters by 41-26. They further claimed that Northam carried the white college vote by a narrow 51-48 margin, while losing white noncollege voters by 26-72. The Catalist analysis is quite different. Their estimate is that Virginia voters in 2017 were 42 percent white noncollege while just 34 percent were white college graduates. Furthermore, they find that Northam carried white college voters by double digits (as I predicted earlier), 56-44, while Gillespie's margin among white noncollege voters was significantly less (65-33) than shown by the exits. As these data imply, the Catalist analysis finds that, overall, the voting electorate was more white and less minority than shown by the exit polls. Blacks were 18 percent of voters not 20 percent; Latinos were 3 percent of voters, not 6 percent. On the other hand, Catalist finds that voters from these two groups were more strongly Democratic (93-6 and 73-25, respectively) than indicated by the exit polls. Ghitza notes that there are some uncertainties to this analysis but they are likely to have had only modest effects (a point or two) on the estimates they produced. The large and very important differences with the exit polls are very unlikely to go away no matter how much they refine their analysis. I agree. It is time to face up to the fact that the exit polls are just not right in important respects and that people should treat their findings with more skepticism. On a hopeful note, Ghitza reports that Catalist may be able to deploy their basic methodology very quickly after coming elections to generate more accurate estimates of vote share and vote preference by demographic group. Let us hope! The exit polls clearly need some real competition. Should the SPD enter another “grand coalition” with Angela Merkel’s CDU? Is Merkel actually a progressive—or as progressive as German politics can be at this point? What is likely to happen in German politics in the next few weeks/months? Judith Meyer, a computational linguist and German political activist (she works with Yanis Varoufakis’ DiEM25 movement), is a singularly astute observer of German politics; she has kindly allowed me to share some of her recent insights with readers. Herewith, an interview with Meyer conducted over email. Q: Should the SPD enter another grand coalition? A: No. It would deal a deep blow to German democracy. It must be possible for the voters to effect a change of government and change of policy. For 12 years now we had the same government (except of a brief stint of CDU-FDP that was in no way different than the others) and we should have it for another 4 years?? That only happens in dictatorships. People decided to rout the SPD in order to force a change. The SPD only got 20% and was forced to swear a holy oath to not have another grand coalition this time. If they go back on it, they will be 10% next time the people have a chance to vote. Schulz promised that there would be a vote among all SPD members on whether to accept the coalition contract. I think that his team will come to an agreement in order to let the SPD members be the ones to refuse. Approval for a Grand Coalition is currently only 25% in the general population (38% in favour of new elections, 14% for CDU-Greens minority government and 11% for CDU-FDP minority government); among SPD members 36% are in favour, while state-level SPD leaders attach significant conditions. 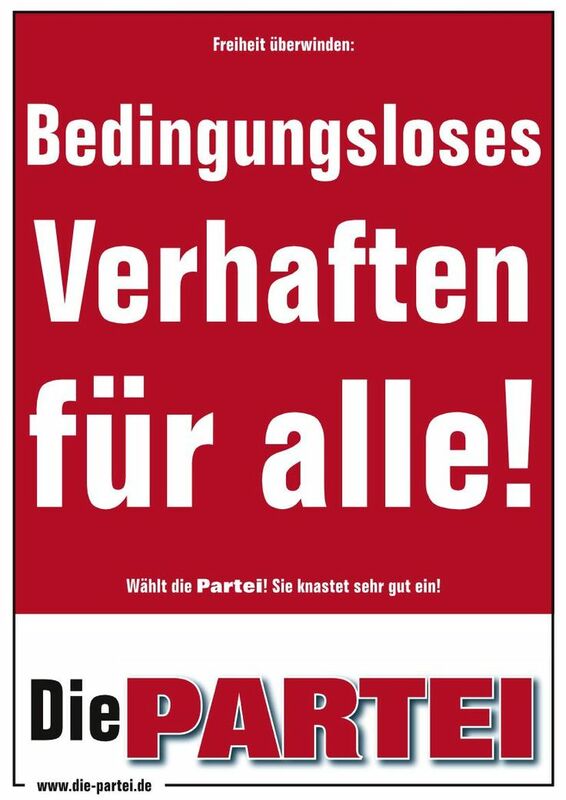 I think as soon as some quid-pro-quo becomes known, the probability that SPD members will approve the coalition contract will be close to zero. We'll have new elections. The parties already agreed on a date: 22 April. Plenty of time for all parties to re-assemble and for public opinion to yield a very different result. Q: At times, Merkel seems to act like a progressive. Should we consider her as such? A: I think German politics cannot be fully understood by American standards. The entire political spectrum is to the left of the US. In the Romney/Obama election, a mock vote among Germans came out 95% in favour of Obama, because most of his radical ideas were considered self-evident here. See this article of mine for a summary of some differences: http://qr.ae/TbcqJ3 So seen within this spectrum rather than the American one, CDU is still right of center, and SPD is approaching right of center ever since the Seeheimer circle (of which Schröder is the most famous) took over party leadership and forced neoliberal or at least third way policies. Merkel has given no sign of being interested in less than business-centric policies, so she is still considered right of center here. That does not prevent her from sharing, to some extent, the pro-refugee attitude that forms part of society's consensus here, and which can be found both on the far left (Die Linke) and the far right (FDP). Until recently we did not have any party in parliament that was anti-refugee, as the nationalist NPD and its predecessors always failed to take the 5% hurdle. Also keep in mind that our constitution is unique worldwide in stating an unequivocal and individual right to asylum (and was written after WWII, at a time when Germany was hosting 12 million refugees on a population of 70 million, so "being overwhelmed" is not a valid argument to suspend the constitution on this matter). Refusing an asylum seeker at the border, before their case can be heard, rejected and the refugee has had a chance to sue against the rejection, would simply be unconstitutional. We learned later that this was one of the reasons Merkel made that fateful decision in summer 2015: according to eyewitnesses, after police and military had already been withdrawn from other regions in order to reinforce the borders, she called a last meeting of the minister of the interior, heads of police, heads of military and so on, and asked for two guarantees: 1) that her decision to repel the refugees would not be deemed unconstitutional by a court, and 2) that there would be no ugly Nazi-evoking pictures of German militarised police and dogs against refugee kids. Since nobody was willing to give those guarantees, she called it off. Welcoming the refugees was in line with popular sentiment at the time - the police had to ask people several times to stop coming to the train stations and shelters with gifts because there were too many. There was a party atmosphere. A month later, among CDU voters, 47% were still in favour of opening the borders and 41% against. Of course this has petered out now with the media reporting more and more about the difficulties of hosting so many refugees, especially with the federal government not doing its part - relying entirely on volunteers to organise language courses, often not refunding municipalities for the extra accommodation and food expenses, and so on. Franz Josef Strauß (former CSU leader) famously proclaimed that there must not be any democratically legitimated party to the right of the CDU/CSU. The article makes reference to that. In other words Merkel's party was supposed to absorb enough of the mild xenophobes so that no truly xenophobic party could enter parliament. They did this by including, under their big umbrella, the segment that might be called 'family values voters' in the US. People who are not just against foreigners but also against gays, against non-traditional gender roles, to some extent against the disruption of technology and so on. It's chiefly these people that turned against Merkel. But Merkel wouldn't have remained chancellor for 12 years and counting if she hadn't alienated these people by successfully co-opting issues to the left of these voters. Whenever there was an issue that looked big enough to unseat her (and not a moment before! ), she added it into her world view. One famous example is gay marriage. 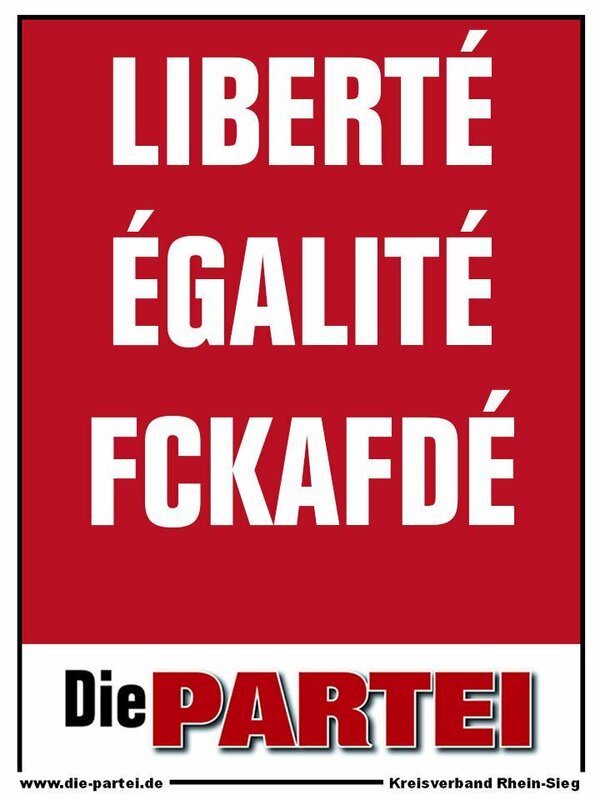 The CDU/CSU leadership has long maintained that civil unions are good enough for homosexuals and they don't need access to civil marriage. However, gay marriage is absolutely uncontroversial in Germany with some 70% in favour even among the CDU/CSU voters (and a small majority of CDU/CSU voters even in favour of adoption rights for homosexuals). Shortly before this year's election, it looked like SPD, Greens and Linke would make gay marriage one of their rallying cries for the election campaign - so Merkel quickly convened a vote, in which she said that personally as a Christian she still doesn't favour gay marriage but she doesn't want to prevent anyone else from voting for it, so Germany approved gay marriage just before parliament went on break and the topic could no longer be used in the campaign. Q: What else should Americans keep in mind when thinking about German politics? A: I feel that our political ideas lead to a lot of talking past one another, probably because ideas like introducing minimum 3 weeks paid vacation would be considered socialist policy in the US, while it would be an attack on workers' rights here ;-) , where the state already guarantees 28 days' paid vacation and in practice 6 weeks isn't rare. We have to consider the direction of change and the ideological justification that parties use. Q: How significant do you think it is that the Jusos (the SPD youth group) have come out against a new grand coalition? There's no real analogue to the Jusos here in the States. A: Wasn't it that Democrats under the age of 35 were overwhelmingly in favour of Sanders, while the party heads had early on decided on Clinton? I don't think our young people are so different. The young people of any establishment party always have stronger opinions and more idealism (or at least less pragmatism) than the old guard, who are used to doing politics a certain way and who have to consider their position within the party or their job in parliament in deciding what view to take on any issue and how strongly to defend that view. The only difference is that in Germany, every couple decades or so there is a new popular party that embodies the spirit of the new generation, as with Bündnis 90/Die Grünen embodying all the political views that the 1968 generation became famous for, and the Piratenpartei embodying a generation shaped by the internet, with party membership reflecting those demographics. An aside: the establishment parties in Germany, compared to those in other countries, were/are particularly tone-deaf about the internet in their utterances and in the policies they tried to enact. Also, even today none of the German government and very few MPs use Twitter. I wouldn't be surprised if a majority still had their secretaries print out emails for them. The Pirate Party peaked at 13% in the polls in 2012 and entered 4 state parliaments at 7-9%. Now however they have deconstructed for various reasons and the big parties are trying to absorb as many Pirate members and voters as possible, with digital campaigns that are a far cry from what we've seen in the US, UK or France even. With this understanding, the SPD members strongest in favour of a new Grand Coalition are those that are afraid of losing their MP positions at a new election, or those that supported Sigmar Gabriel and who are afraid they will lose their position in the pecking order if Martin Schulz prevails. Meanwhile the youth organisation Jusos has an innate desire to change the world (albeit those joining SPD for that purpose must necessarily be less ambitious, and more ready to accept existing hierarchies, than those joining Greens or Linke, which are more horizontal organisations and less satisfied with the status quo), and this desire is certainly amplified by the idea that a change in party direction would also bring other people to the top (the Jusos don't currently have anyone near the top). 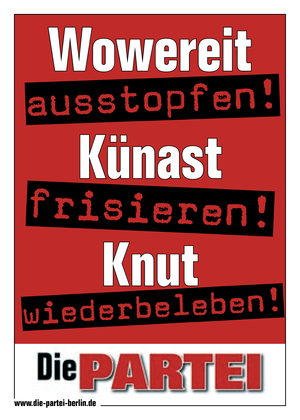 Four years ago, we already had this situation: some of the SPD were strongly against the Grand Coalition, and the Jusos were among the strongest opponents, welcoming Sigmar Gabriel with loud protests when he visited their assembly ahead of the coalition treaty being signed. In the end, the SPD membership voted 75.96% in favour of the coalition treaty (details on the vote turnout etc: http://www.spiegel.de/politik/deutschland/spd-mitgliederentscheid-sozialdemokraten-stimmen-fuer-grosse-koalition-a-939081.html). This is possible because Jusos, and young people in general, are a very small part of SPD. The Jusos organisation counts ca. 70,000 members (stable, non-increasing for the past 10 years). Every SPD member under 35 is automatically a member of Jusos and additionally there is a possibility to sign up as a Jusos member without being a member of SPD, which was 20,000 people last time I checked. So Jusos might be 50,000 out of the SPD's current 443,000 members. (Aside: this is a huge decrease from the 70s: in the 70s, SPD had over a million members and Jusos had 300,000. The decline in membership is across all parties except the Greens) The average age of SPD members is now 60; only 32% of party members are women. I believe that this year the opposition to the Grand Coalition is much stronger than in 2013, both within Jusos and in the general party, certainly among the voters. More people have understood that the Grand Coalition is harmful to the SPD, including to their own chances of being elected or re-elected. The party leader and candidate for chancellor Martin Schulz himself is strongly against the Grand Coalition. That being said, there is a penalty in German society for not being ready to play ball (the FDP is suffering now), so I think it's most likely that the Grand Coalition will be rejected by a party vote rather than the leadership accepting the blame for the talks failing. Q: Could you tell us a little more about what’s happening within the German left—broadly defined—these days? So if the SPD goes the way of a Grand Coalition, it may find itself losing supporters to a new grouping, while if it doesn't, it may find itself renewed from within. Of course another important factor is of the leadership fight between Wagenknecht (socialist/xenophobic/anti-European) and Kipping (socialist/green/pro-European) in Linke. Germany may look calm so far but is unlikely to stay that way, no matter which way the dice fall. Q: How should we understand the rise of the Pirate Party and similar formations in Germany and elsewhere? A: As I alluded to further above, I see the Pirate Party's success mainly as a result of the other parties' failure to understand the concerns of internet users (e.g. protecting civil liberties on the net, greater transparency and opportunities for participation, very progressive views in general), along with a generational shift that might have been due anyway. That being said, one interesting aspect that sets them apart from establishment parties is also "fun" (and it applies even more to DIE PARTEI, which doesn't have a program beyond "fun"). I am not sure if / how this plays out in other countries, but M5S (Five Star Movement in Italy) was founded by a comedian, so maybe they are more fun than the establishment parties, too? 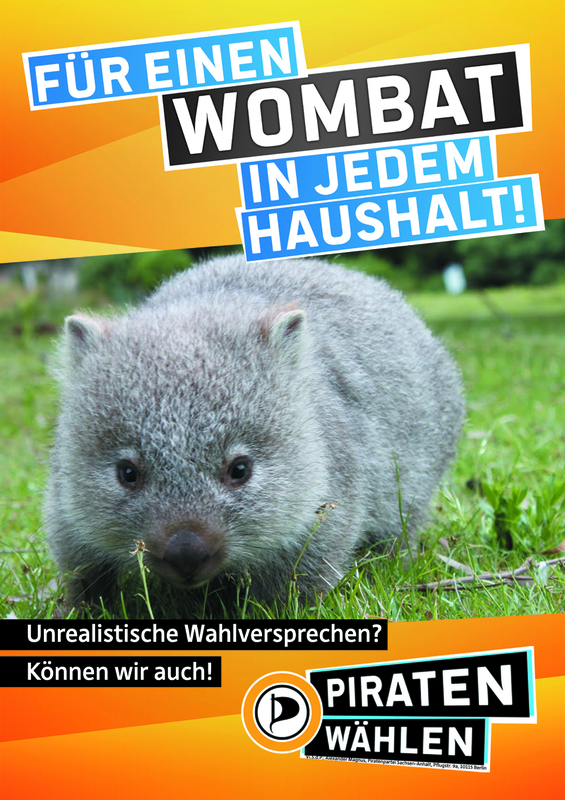 · https://die-partei-berlin.de/wp-content/uploads/2011/06/wowereit-ausstopfen-0.png (DIE PARTEI: "stuff [Berlin's former mayor] Wowereit, send [former head of Greens] Künast to a hairdresser and resurrect [the Zoo's favourite polar bear] Knut"
Apart from that, there are many ways that the Pirate theme could be (and was) used for fun. That involves e.g. 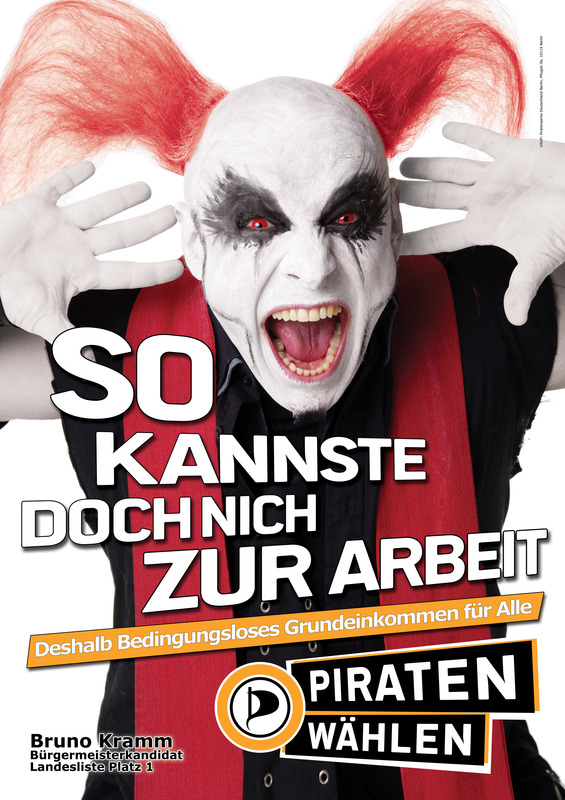 costumes and theme actions (boat-based campaigning), but also one of the key party slogans of all times: "Klarmachen zum Ändern" (make ready to change), a play on words with the actual pirate phrase "Klarmachen zum Entern" (make ready to board). 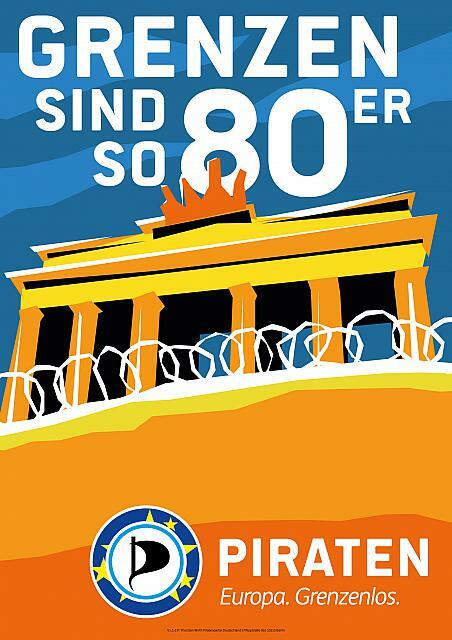 Some of the fun elements, especially the ones referencing nerd culture and online culture, definitely were a hindrance to the Pirate Party's expansion in Germany. Also there are a lot of people, especially among older Germans, who have a strict view of where jokes and un-seriousness are acceptable and where not (e.g. professionals like lawyers and doctors mustn't tell their clients jokes, all professionals must wear suit & tie or whatever passes for a uniform of the trade,...). But it seems that there is nevertheless a good share of German voters that likes the idea of more fun in politics, or accepts it as a distinguishing feature from the establishment.